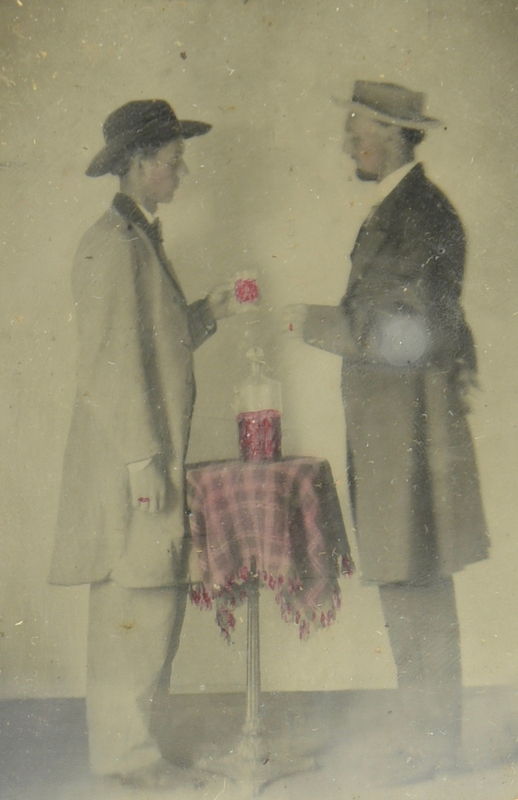 Nine (9) Assorted Containers and Occupational Daguerreotype. 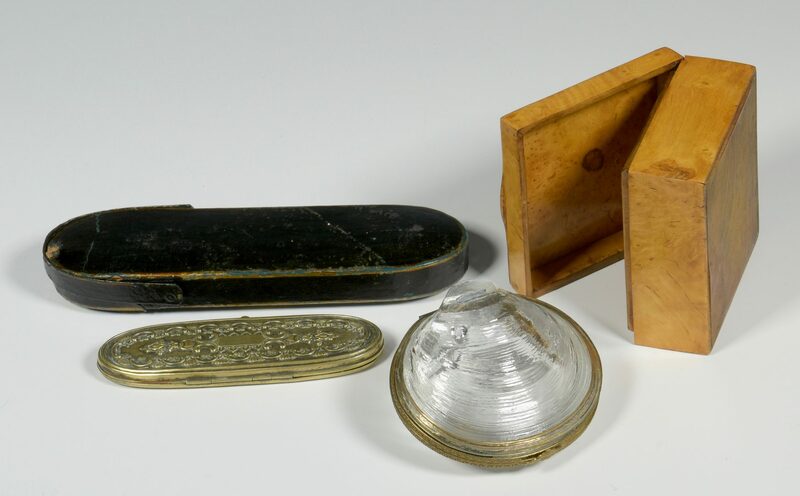 1st group: 3 small hinged tortoise shell boxes including domed box on bun feet with tartan paper interior; ovoid coin purse with brass inlay and monogram "M W", fitted leather interior; slant-top ring display box with inlaid mother-of-pearl floral spray (3/4-1 7/8" H, 1 1/2-3 1/4" W) all English, mid-late 19th century. 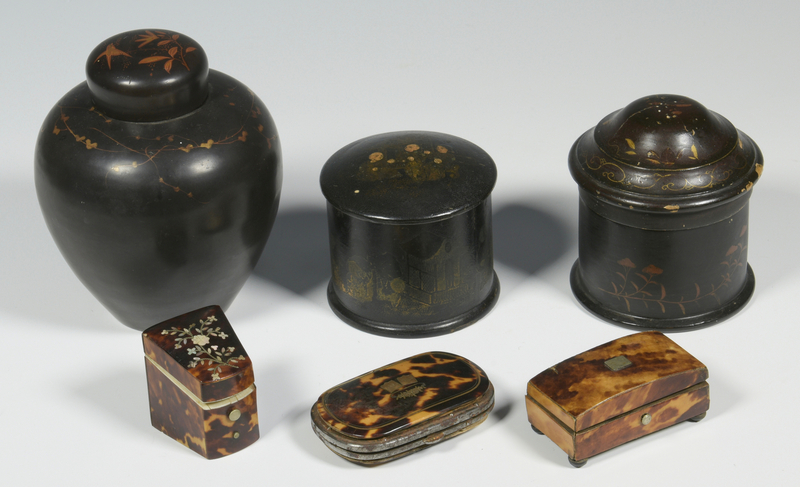 2nd group: 3 small Asian lacquerware containers including ginger jar form tea caddy, black ground with gold floral vine designs, lid with bird and floral spray, red lacquer under lid and red lacquer inner lid; black circular dome covered container with gilt vine decoration and red lacquer interior, black circular covered container with gilt chinoiserie scenes, black interior (2 3/4"-5 1/4" H). 3rd group: 2 eyeglass cases, black Continental papier mache eyeglass case with hinged opening at one end, polychrome floral and gilt decoration (7 5/8" L), Continental or English, late 19th century; Gilt copper chased eyeglass case, inscribed "J B Osgood" on surface (5" L), English, mid-late 19th c. 4th group: Burlwood hinged square box (2" H x 3 3/4" W x 3 1/2" D), English, late 19th century; Hinged crystal clam shell with "pearl" inside and bronze mounts (2 1/4" H), possibly French, late 19th-early 20th century. 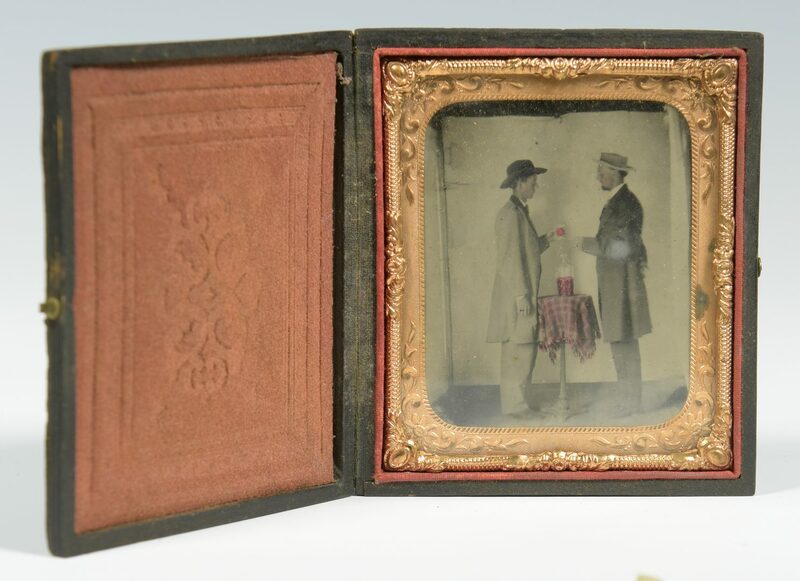 Also included is a daguerreotype of gentlemen with whiskey, color added to tablecloth and whiskey, in relief stamped fitted leather case with a gilt brass mat. Possibly Occupational of a Distiller. Case – 3 5/8" H x 3 1/4" W x 5/8" D, American, late 19th century. Provenance: Estate of James J. Allen, Knoxville, TN. CONDITION: 1st group: Wear and some losses to tortoise shell. Rust to metal frame of coin purse. 2nd group: Lid of tea caddy possibly not original. Lid of 2nd container severely cracked and chipped, 3rd container with craquelure and fading to image. 3rd group: Papier mache case with chips and some overpainting. Gilt copper case with green oxidation to interior. 4th group: Losses to hinges and split left back corner of burlwood box. last item: Daguerreotype case with minor wear, image in very good condition.